We get the job done right and right on time. nobody does concrete like Branck Construction. 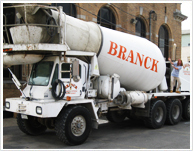 At Branck Construction, we own our trucks and gear so you don't have to wait for a third-party mixer to deliver. especially when it comes to unpredictable weather. Rocco and David Branck have a lifetime of experience in helping people and businesses with their construction projects. Branck is more than concrete. Whether you need a kitchen or bath remodel or a new roof, Branck has the experience to get the job done.